PLEASE READ AND REVIEW THE TERMS THOROUGHLY PRIOR TO BIDDING IF YOU HAVE NOT READ AND UNDERSTAND THESE TERMS PLEASE DO NOT BID BY BIDDING ON THIS AUCTION, BUYER AGREES TO ALL TERMS AND CONDITIONS SET FORTH AND ENTERS INTO A CONTRACTUAL AGREEMENT TO PURCHASE THE ITEM(S) UNDER THE FOLLOWING TERMS AND CONDITIONS: 1. CATALOG: Aumann Auctions has put forth every effort in preparing the catalog for this auction to provide accurate descriptions of all items. All lots are sold AS-IS, WHERE-IS, with all faults, imperfections and errors of description. 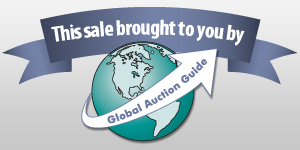 Preview is available to all parties, due diligence is the responsibility of the bidder/buyer. Printed statements or descriptions by staff are provided in good faith and are matters of opinion. 2. PAYMENTS: There is a 10% Buyer�s Premium on all literature, memorabilia and parts, 5% Buyers Premium on tractors, engines and equipment that will be added to your total purchase. All sales are final. No credit card charge backs will be allowed. All accounts must be settled at the conclusion of the auction. We accept Cash, Checks, Certified Funds, Visa & MasterCard ONLY. If paying by credit card, you will be charged for your purchases, plus buyers premiums, plus a 5% Credit Card Fee and any applicable taxes. NOTHING will be charged to your card until a purchase is made. Note: Checks may be processed the day of the auction; be sure to have adequate funds in your account. An insufficient funds charge of $250 will be imposed plus the liability of Default of Buyer below. 3. DEFAULT OF BUYER: Successful bidder not paying for items within 3 days of the date of the auction will be considered in default. Such default by the Successful Bidder will result in that Bidders liability to both the Seller and Aumann Auctions, Inc. Seller shall have the right to (a) declare this contractual agreement cancelled and recover full damage for its breach, (b) to elect to affirm this contractual agreement and enforce its specific performance or (c) Seller can resell the items either publicly or privately with Aumann Auctions, Inc. and in such an event, the Buyer shall be liable for payment of any deficiency realized from the second sale plus all costs, including, but not limited to the holding/transporting/storage costs of the items, the expenses of both sales, legal and incidental damages of both the Seller and Aumann Auctions, Inc. In addition, Aumann Auctions, Inc. also reserves the right to recover any damages separately from the breach of the Buyer. The purchaser agrees to pay all reasonable attorney fees and costs incurred by Aumann Auctions, Inc. in the collection of funds. The purchaser also agrees to interest of 2% per month plus storage fees of any unpaid balance due Aumann Auctions, Inc. and any other costs or losses incurred by the Buyers failure to adhere to these terms. Any debt collection or dispute proceedings will be litigated or arbitrated in Montgomery County, Illinois at the option of both the Seller and Aumann Auctions, Inc. Both the Successful Bidder and Seller shall indemnify Aumann Auction, Inc. for and hold harmless Aumann Auctions, Inc. from any costs, losses, liabilities, or expenses, including attorney fees resulting from Aumann Auctions, Inc. being named as a party to any legal action resulting from either Bidders or Sellers failure to fulfill any obligations and undertakings as set forth in this contractual agreement. 4. Bidding Agent: If you as a bidder wishes for an agent to act on your behalf and place bids with Aumann Auctions, Inc. A Bidder Authorization form will need to be completed and returned to Aumann Auctions, Inc. prior to the auction. Please request this in advance. BIDDER VERIFICATION: Bidding rights are provisional, and if identity verification is questionable, Aumann Auctions, Inc. has the right to reject the registration, and bidding activity will be terminated. The Seller and Aumann Auctions, Inc. reserve the right to preclude any person from bidding if there is any question as to the person's credentials, mental fitness, etc. Bidders agree to keep their username and password confidential as they are responsible for ANY and ALL activity involving their account. If the registered bidder's user name is offensive to Aumann Auctions, Inc. or in their sole opinion detrimental to Bidding Activity, then Aumann Auctions, Inc. reserves the right to delete the bidder from bidding or unilaterally change the username with notification to the Bidder. When using the web site you must obey any and all local state and federal laws. Violations will result in termination of web site use privileges. MAXIMUM BID: When you bid your maximum bid, the current bid price does not automatically advance to your maximum bid. Another bidder has to bid to increase the current price and the computer will automatically bid up to your maximum in the increments specified. AUCTION END TIMES: Aumann Auctions, Inc. online only auctions are timed events and all bidding will close at specified time. However, our auctions also have what is called an Auto Extend feature. Any bid placed within the final 5 minutes of an auction results in the auction automatically extending 5 additional minutes. The bidding will extend in 5 minute increments from the time the last bid is placed until there are no more bids, and the lot sits idle for 5 minutes. Therefore, the auction will not close until all bidding parties are satisfied and no one can be outbid at the last seconds without having another opportunity to bid again. TECHNICAL ISSUES: In the event there are technical difficulties related to the server, software, internet or any other online auction-related technologies, Aumann Auctions, Inc. reserve the right to extend bidding, continue the bidding, or close the bidding. Neither the company providing the software, nor Aumann Auctions, Inc. shall be held responsible for a missed bid or the failure of the software to function properly for any reason. CONDUCT OF THE AUCTION: Conduct of the auction and increments of bidding are at the direction and discretion of Aumann Auctions, Inc. Aumann Auctions, Inc. reserves the right to reject any and all bids for any reason and also reserves the right to cancel this auction, or remove any item or lot from this auction prior to the close of bidding. All decisions of Aumann Auctions are final. Your bid on this auction indicates both an understanding and an acceptance of the terms of this contractual agreement between yourself and both Aumann Auctions, Inc. and the Seller and that you, as the Bidder, are prepared to purchase items under these terms and conditions. THE GREAT WESTERN LINE TIN LITHOGRAPH SIGN, SMITH MANUFACTURING CO.
1900 YARD LONG LITHOGRAPH FOR THE MINNEAPOLIS THRESHING MACHINE CO.
ADRIANCE BUCKEYE FARM IMPLEMENTS LITHOGRAPH FOR THE ADRIANCE. PLATT & CO.
AMAZING IHC 9X16 DEALER'S BINDER COVERING IHC'S ENTIRE LINE OF MOGUL, TITAN, MCCORMICK-DEERING ENGINES, TRACTORS, TRUCKS, AUTOWAGONS, ETC. 1914 THE CREEPING GRIP TRACTOR CATALOG, THE BULLOCK TRACTOR CO.